It's always bittersweet to head south. South is the direction of the closest big city, San Francisco. When we were kids it was the most exciting thing, a trip to the city down 101. But not to stay long in the chaos. We didn't belong there. My happiest days were playing on these beaches with a dog, sweaters and jackets mandatory even in summer. Most of my generation, schoolmates and siblings, migrated to cities on the West Coast like San Francisco or Portland. Once we were teenagers there was very little here for us. We had to leave. But it does not get easier. Rolling quickly down the long driveway and not looking back, that's the only way. A stop for provisions at Murphy's Market in Trinidad. They're good people, they can have my city money. An early memory of Trinidad was my mom piloting our 1959 Mercury station wagon on the old highway, now called Scenic Drive. The road was cut out of a cliff and it perpetually slips into the Pacific. From time to time it was closed to traffic but a bike can always get through. The views are spectacular. The Mercury was not a nimble vehicle. It was as wide as a house with no power steering. The steering wheel was red, like the rest of the interior. We drove it until it gave up the ghost. This morning the short dirt portion reminds me a little of Route 66. The old unpaved alignment, and the fun someone had while patching the road. Apparently I'm heading in the right direction! It's 101 for a couple of miles, then off again on Hammond Trail. 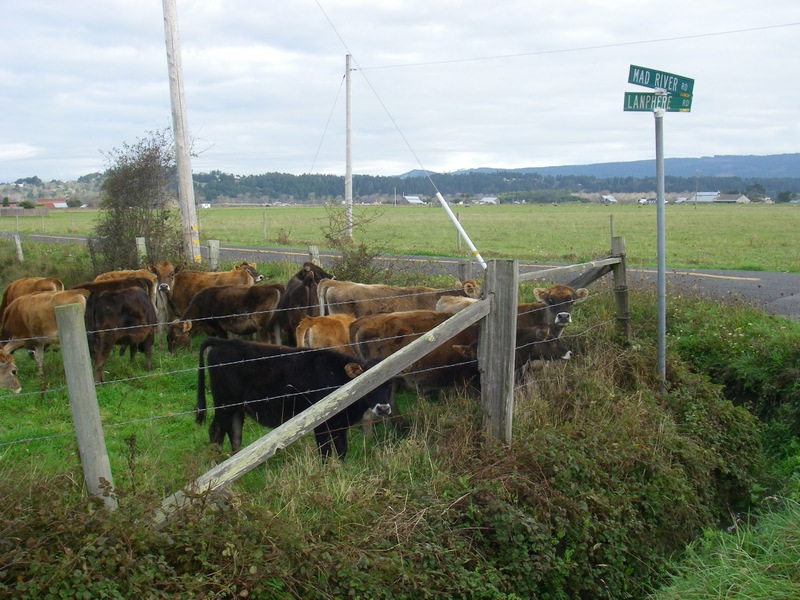 It dumps out in the Arcata Bottoms, where the happy cows hang out. Some dairies now have the Organic Valley shingle hanging out in front. 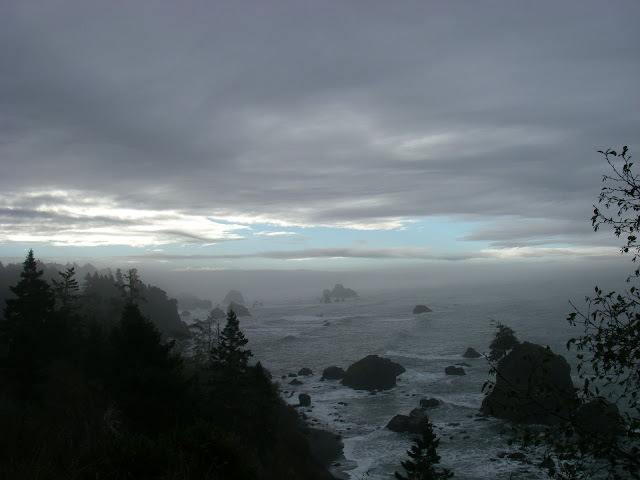 I'm quite happy to bypass Arcata; those memories can stay there for now. The Samoa Bridge is a demarcation point, of shedding the past and feeling a bit free. Just then my stomach tells me it could use a little something. It gets a raspberry muffin in Eureka, at the Vellutini Baking Company. A new place since my last trip. Humboldt County is starting to embrace the foodie revolution. Local, fresh, organic. Grass-fed. Bakeries on every corner (almost)! I say bring it on, bring on good change. My next stop is Loleta, investigating whether a bakery shown on Google Maps could be in fact, real. All in the name of research. The place is mobbed. You have to know Loleta... abandoned in the full sense of the word. The whole town spans a couple of blocks in each direction, scary marginal folks living in old motels-turned-tenements. An unused railroad line running through the middle of town. Vehicles rotting in front yards. For years the Loleta Cheese Factory held down the fort as the one viable business. But you can buy their cheese at the grocery store. No need to visit. Now around the corner in an old storefront, the Loleta Bakery is serving high-end homemade food like artisan flatbreads, soups, sandwiches, muffins, breads. Sit-down tables with white tablecloths. Why, it's Healdsburg North! The folks inside eye me with disapproval. Scruffy local, they think. I pay for my bran muffin and move along. Mental note: next trip, stop for lunch! A quest for water takes me to the shop next door. As the owner rings me up he confirms that since the bakery opened 3 years ago, his business has boomed. We both know what it was like here before; Appalachia-style poverty and decay. It takes luck and work and engineering to not get sucked in. Another reason to leave. More dairies in the Eel River delta on the way to Blue Slide Road. Blue Slide was a discovery from riding the Tour of the Unknown Coast in 1998. 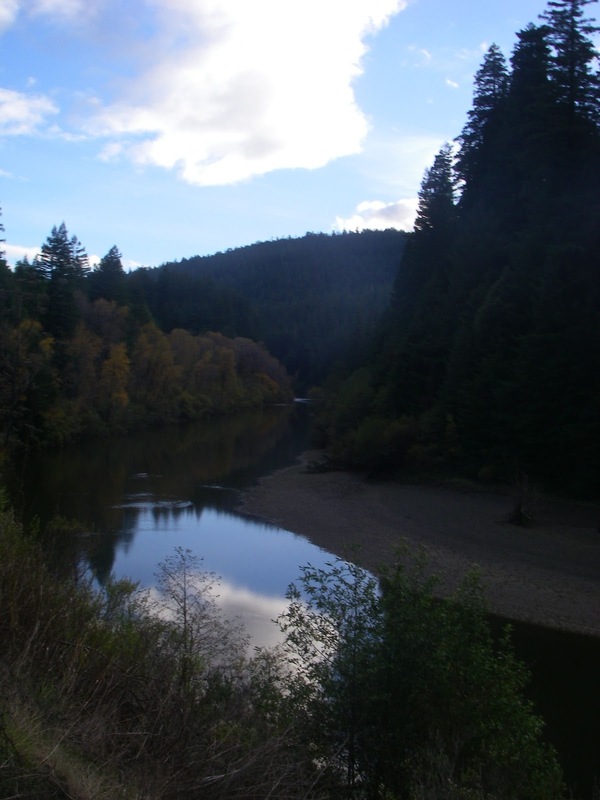 The first truly hilly road of the day, it leads into Rio Dell and across the Eel River to Scotia, toward Avenue of the Giants. At the information sign a woman walking back to her car asks if I want the tourist pamphlet. No, but we chat a little. She's from Eureka, worked at the university and knows my dad. She introduces me to her husband as "Bob Astrue's daughter", which is comforting and disturbing at the same time. Her name is Giesele. She and her husband are hikers who have written a book on short hikes among the redwoods. I promise to look for it at REI at home. Avenue of the Giants is another old alignment of 101. But that's not why people come here. 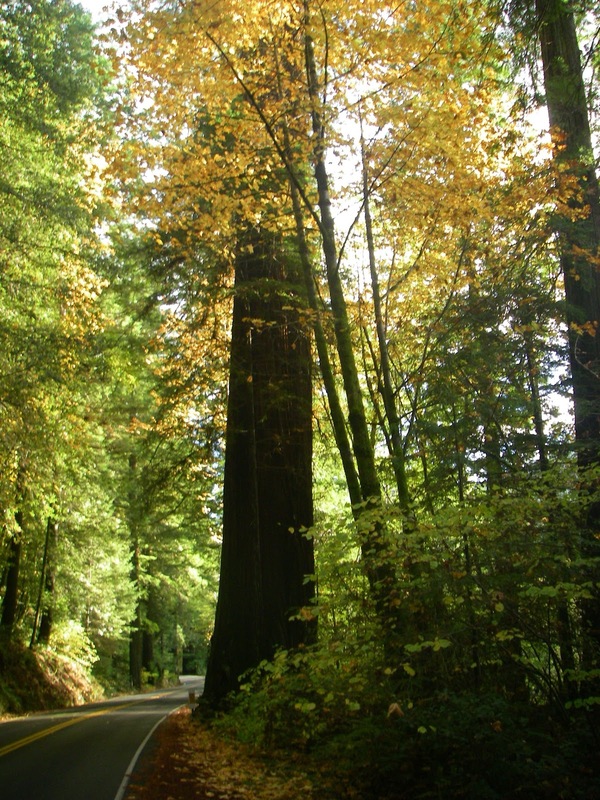 It's a barely-two-lane road surrounded with old growth redwoods. For 32 miles. The forest is so thick it mostly hides the Eel River, which the road follows. Deciduous trees grow here too and today they're slowly shedding their leaves. Yellow leaves ride gravity down to the road surface with the dark redwoods towering above, dark, implacable, silent. I'm grateful to visit here again, a type of gratitude you never have for ordinary, close-by experiences. Grateful to have some place else to go, too. Finally it looks like the weather is going to hold for the trip. And on a bike, the perfect vehicle for noticing things. The light is ending as I get back on 101 and climb two big hills to Garberville. Pass two other bike tourists, a Japanese couple. Look with longing at the "MO" letters to the left in town, the first two letters of a MOTEL sign. Grateful for my Schmidt hub and Edelux lamp, faithful friends. On the right, far below the highway snakes the Eel. The waxing gibbous moon is up already, and its faint light in the east combines with the last glow of daylight in the west. Together they illuminate a layer of white mist on the river, masking the water. The mist is like cotton pulled apart in irregular shapes. I've never seen anything like it. Grateful that Danny, clean clothes, and a warm shower are waiting at the Benbow Inn on the other side of the hill. I love the first and the last photos. Avenue of the Giants sounds like a beautiful ride!